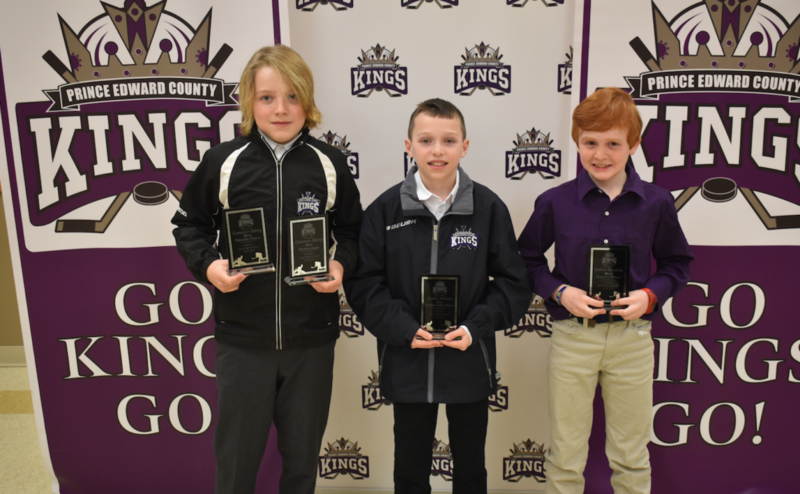 The Prince Edward County Minor Hockey Association capped off it’s 2018-19 season in style at the Highline Hall on Tuesday evening as the organization hosted it’s annual awards banquet. 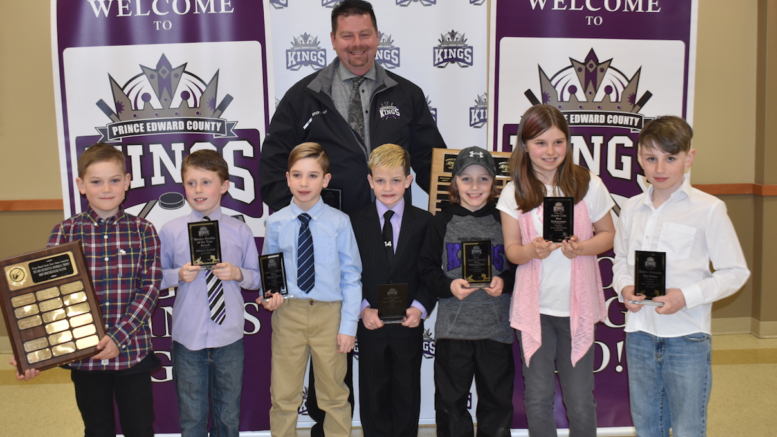 Rep hockey players ranging from Novice to Midget gathered as PECMHA handed out hardware to the standouts who starred for the Kings this past season. President of PECMHA Steve Payne congratulated the players for representing Prince Edward County in such fine fashion and said success in sport can’t always be measured in wins and losses, championships or banners. The Terpstra Equipment Atom BB Kings had an early season tournament win in Brighton, while the County Farm Centre Novices played for the finals at both the Campbellford Tournament the Warrior Tournament in St Catherine’s. The Lehigh Cement Bantam BB Kings had a late season championship in Kingston coming out of the Kids for Kids tournament while the Ainsworth Funeral Home Midget BB Kings represented the organization well at a tournament in Montreal. Before handing out the awards, the President thanked County of Prince Edward Arena staff, sponsors, Introduction to Hockey organizers Debbie and Darren Yuill, gatekeeper Rosemary Moore, local referees, team volunteers, the PECMHA executive and, finally, parents. “I’ve saved you for last for a reason. When I say parents, I mean parents, guardians, aunts, uncles, brothers, sisters, neighbors, friends anyone responsible for bringing these King players to the rink for practices or games. Representative hockey is a huge commitment and one that probably will go unacknowledged by your kids for another 20 years. Most kids won’t understand or appreciate what you’re doing until they are running the roads with their own children and then hopefully a light bulb will go off and they then realize how much effort and dedication it takes. I know my thanks doesn’t carry the same weight as theirs will, but I want you to know we appreciate you,” Payne said. 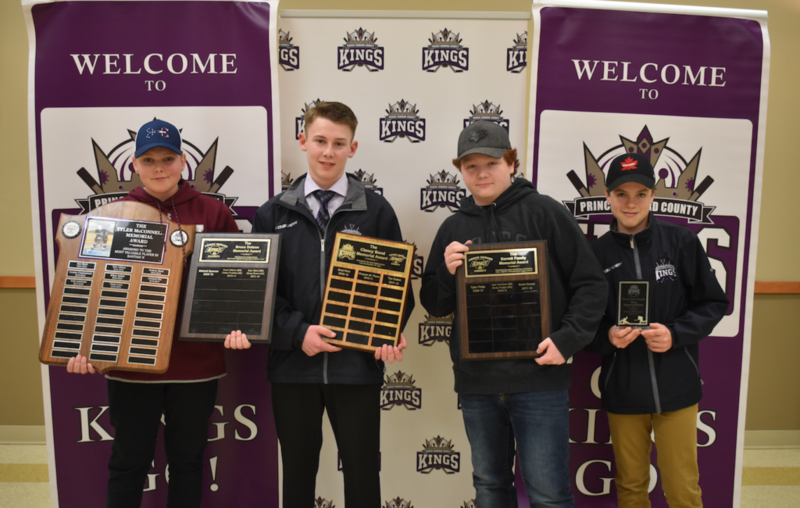 Among the major award winners Tuesday, Bantam Kings blueliner Charlie Smith took home both the Darrin Brooks Memorial Award for top Pee Wee Defenceman as well as the Matt Stever ‘Rudy’ Memorial Award which goes to the Pee Wee or Bantam player that best leads by example, is dedicated to his team and best shows enthusiasm, tenacity and passion for the game much like the late former Picton Pirate did. 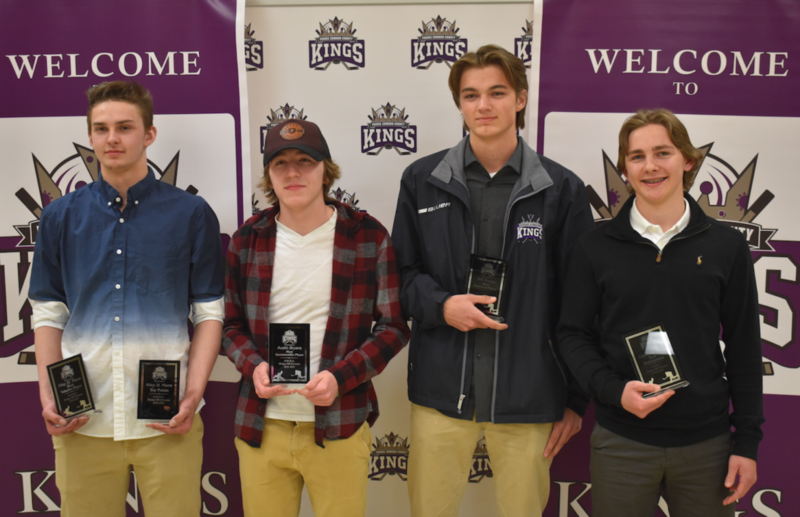 Another multiple award winner on Tuesday was Bantam Kings goalie Nolan Lane who took home the Tyler McConnell Memorial Award as team MVP as well as the Bruce Dolson Memorial Award for lowest Goals Against Average (1.59) amongst all County Kings goalkeepers. Bantam blueliner Liam Rice was the Clancy Bond Memorial Award winner for top defenceman in his age group. •Tom Verner Memorial Award for most goals by Kings player in the organization: Alex Lavender (32 goals). •Novice Rookie of the Year: Weston Byford. •Don Cournyea Memorial Award for Most Sportsmanlike player for Novice/Atom: Gilbert Graham. The Don ‘Ducky’ Wight Memorial Award for top coach: County Farm Centre Novice BB Kings coach Chad Camp. 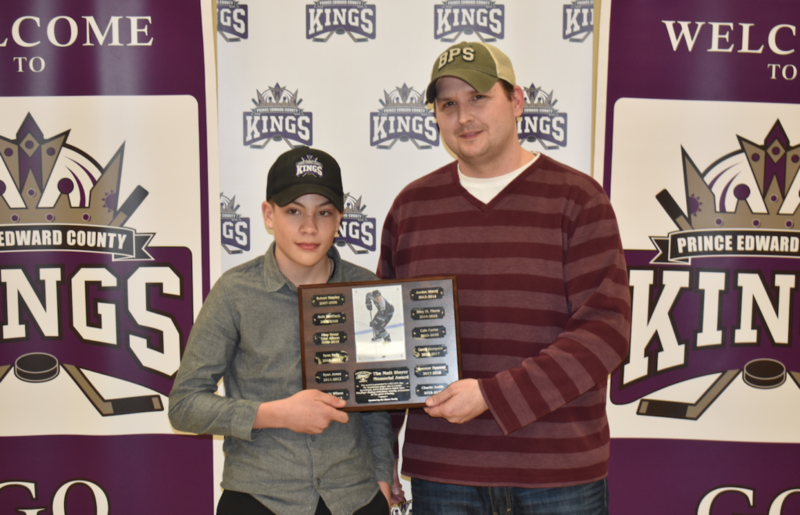 •The Barrett Family Memorial Award for leading point getter: Bantam Kings BB forward Aiden Reddick (35 points in 22 OMHA games). 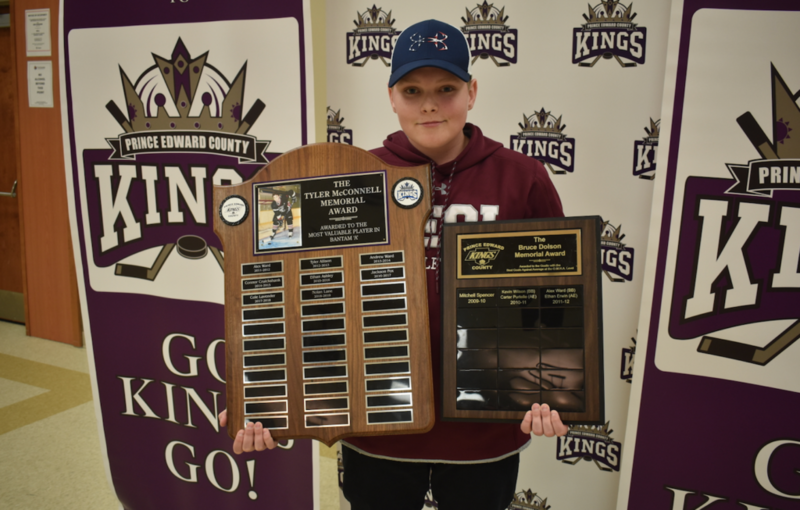 •The Prince Edward County Minor Hockey Association Appreciation Award: Ben Cowan. Novice: Landon Latchford (MVP), Caleb Krentz (Most Sportsmanlike Player), Blake Shephard-Benway (Most Improved Player), Avery Cole (Best Defenceman), and Easton Vanhecke (Top Points). Atom: Cameron Billing (MVP and BD), Grady Holmes (MSP), Nathan Mowbray (MIP) and Alex Lavender (TP). Pee Wee: Lainey Van Vlack (MVP), Theo Lavender (MSP), Connor Borton (MIP) and Dakin Jones (TP). 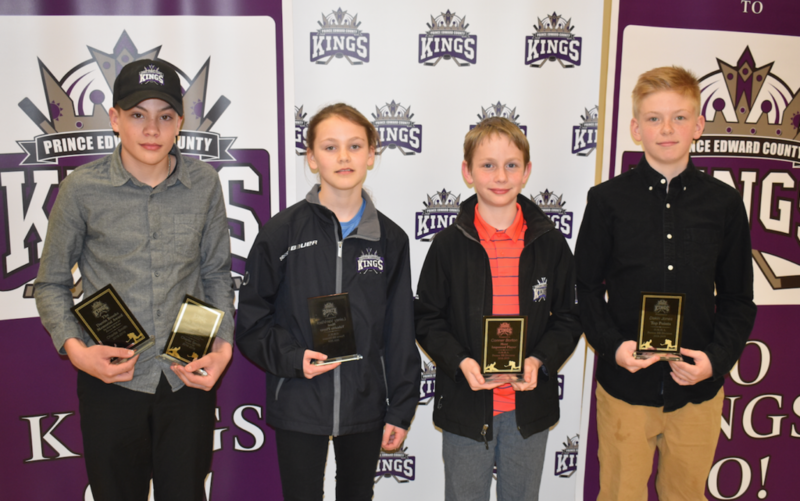 Bantam: Nolan Lane (MVP), Jarrett Osterhout (MSP), Reese Kleinsteuber (MIP), Liam Rice (BD) and Aiden Reddick (TP). Midget: Riley St. Pierre (MVP and TP ), Austin Bryans (MSP), Will Ronan (MIP) and Cameron Pero (BD).